Beauty Resource are sceptical about hair growth treatments because they are usually about as effective as a can of coke masquerading as the elixir of life. However, after receiving mainly rave reviews we decided to give this potion a go before consigning it to the beauty bin. 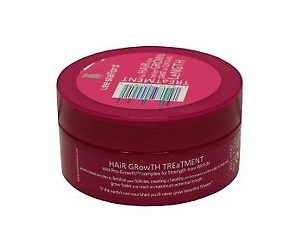 Lee Stafford Hair Growth Treatment is ‘ For Hair that never Grows past a certain Length’. Now science tells us that once our hair reaches a certain point, it continues to grow but we don’t recognise the difference as it becomes longer. Women say, ‘My hair has stopped growing! !’ and obviously they are right. So, Lee Stafford came up with this pro-growth complex, which contains a protein based formula which fertilises the follicles and helps the hair to grow faster. The hair and scalp complex work at reducing hair loss whilst improving follicle health and increasing the ability of the hair to anchor to the scalp. The soothing formulation reduces irritation and moisturises the scalp. It addresses hair and scalp ageing at a cellular level whilst providing an improvement in tensile strength to give body and texture by penetrating the hair reaching the inner cortex. It is meant to be used between shampooing and conditioning and is to be left on the hair for five minutes before rinsing. They advise using daily until hair improves and then cutting down to once a week. It comes in at £6.99 which isn’t bad but is not a replacement for your conditioner and requires an egg sized amount every time its used. However, when you put things into perspective, hair growth is a very lengthy, tiresome and frustrating process so anything that speeds it up is well worth a try!